Acrostic poems are a fun way for kids to practice writing skills. An acrostic poem uses the letters in a word or phrase to start each line of writing. Topics include most major holidays, sports, and more. 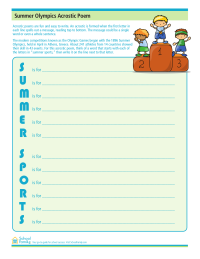 Think of a word or phrase that starts with each letter in the words "Summer Sports" to complete this poem! 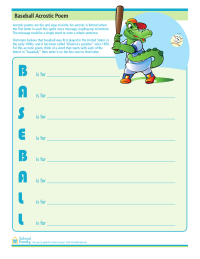 Sports fans will enjoy thinking of a word or phrase that starts with each letter in the word "baseball." 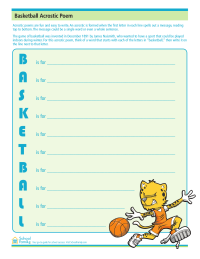 For this acrostic, think of a word that starts with each of the letters in the word "Basketball," then write it on the line next to the letters. Think of a word that starts with each of the letters in the word "Soccer." 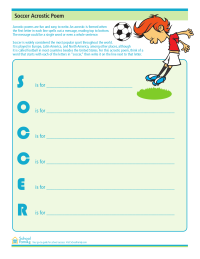 An acrostic poem activity for kids who like football. Think of a word or phrase that starts with each letter of the word "football." 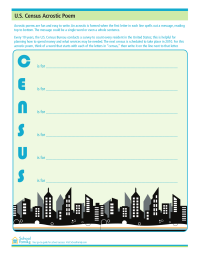 For this acrostic poem, think of a word that starts with each of the letters in “census,” then write it on the line next to that letter. 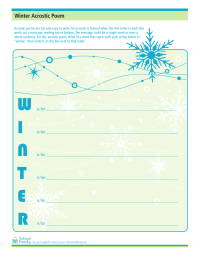 For this acrostic poem, think of a word that starts with each of the letters in “winter,” then write it on the line next to that letter. 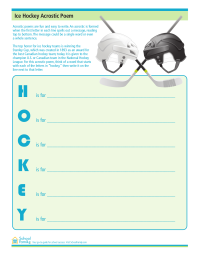 Winter Olympics acrostic writing activity. 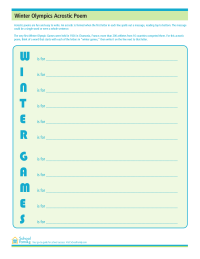 Think of a word or phrase that starts with each letter in the words "Winter Games." 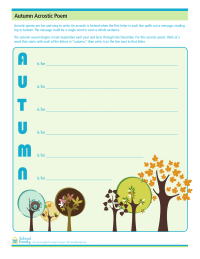 Celebrate fall with this acrostic poem activity. Think of a word or phrase that starts with each letter in the word "Autumn." 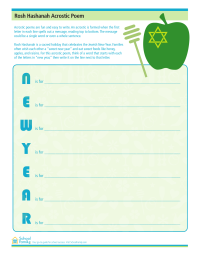 Celebrate the Jewish New Year with this Rosh Hashanah acrostic poem activity. 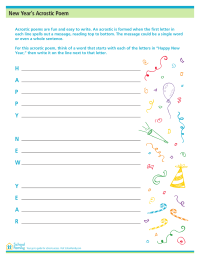 Think of a word or phrase that starts with each letter of the ord "New Year." 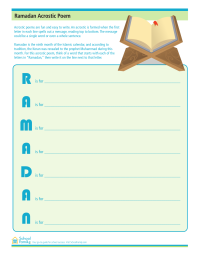 Celebrate Ramadan with this acrostic poem activity. Think of a word or phrase that starts with each letter of the word "Ramadan." 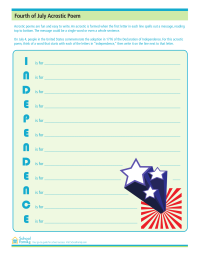 Celebrate the 4th of July with this acrostic poem activity. Think of a word or phrase that starts with each letter of the word "Independence." 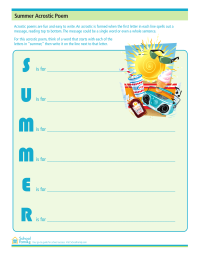 Celebrate summer with this acrostic poem activity. Think of a word or phrase that starts with each letter in the word "Summer." 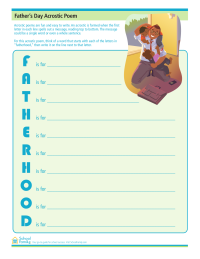 Celebrate Father's Day with this acrostic poem activity. Think of a word or phrase that starts with each letter in the word "Fatherhood." 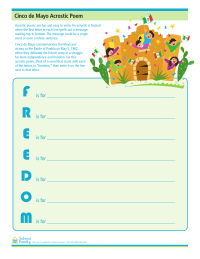 Celebrate Flag Day with this acrostic poem activity. Think of a word or phrase that starts with each letter in the words "Old Glory." 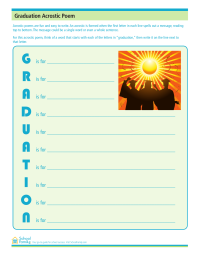 Celebrate graduation with this acrostic poem activity. Think of a word or phrase that starts with each letter in the word "graduation." 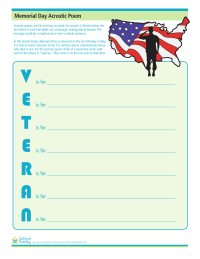 Celebrate Memorial Day with this acrostic poem activity. Think of a word or phrase that starts with each letter of the word "veteran." Celebrate Mother's Day with this acrostic poem activity. Think of a word or phrase that starts with each letter in the word "motherhood." 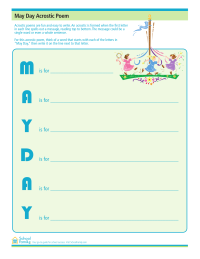 Celebrate May Day with this acrostic poem activity. Think of a word or phrase that starts with each letter of the words "May Day." 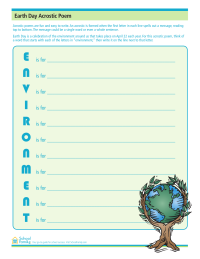 Celebrate Earth Day with this acrostic poem activity. Think of a word or phrase that starts with each letter of the word "environment." 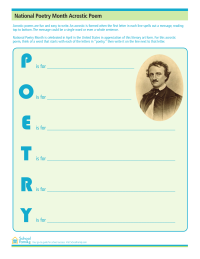 Celebrate Poetry Month with this acrostic poem activity. Think of a word or phrase that starts with each letter of the word "poetry." 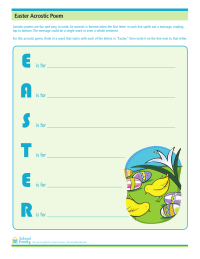 Celebrate Easter with this acrostic poem activity. Think of a word or phrase that starts with each letter of the word "Easter."